Leidos oversees the testing of FUSRAP sites in St. Louis for the Army Corps. But its main gig is spying for the U.S. intelligence agencies, with zillions in contracts from the DOD, CIA, NSA and Homeland Security. Ain’t nobody’s business but their own: Leidos hall of mirrors on South Grand in St. Louis. The FUSRAP worker testing soil near Coldwater Creek in Florissant is employed by Leidos, a defense contractor that receives billions of dollars in federal contracts from intelligence agencies. 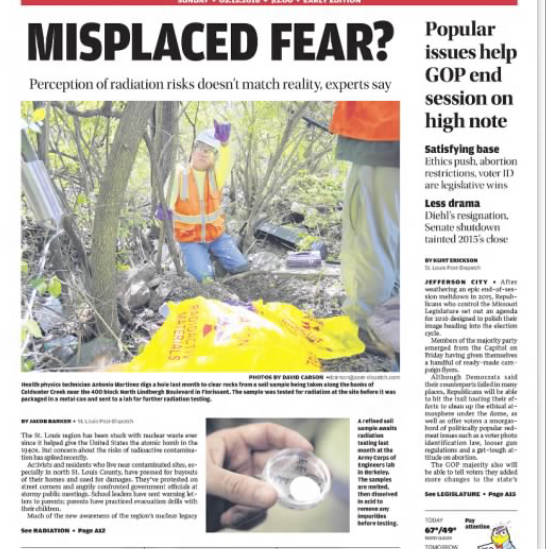 The St. Louis Post-Dispatch front-page story on Sunday May 16, 2016 dismissed community concerns about radioactive contamination in Coldwater Creek and West Lake Landfill in North St. Louis County. 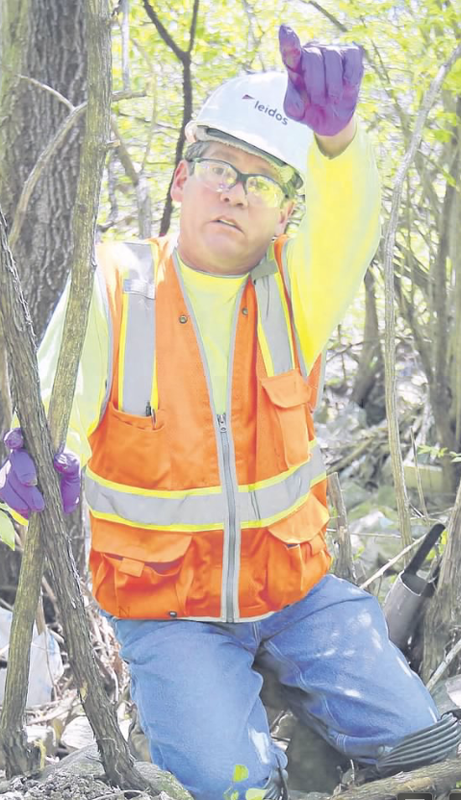 The rhetorical question was followed by a photograph of a worker in an orange safety vest and hardhat kneeling along the banks of Coldwater Creek. The cutline identifies him as health physics technician Antonio Martinez, but it doesn’t identify his employer. To figure out who employs Martinez it’s necessary to zoom in and take a closer look at the picture. Martinez’s hardhat is inscribed cryptically with one word: “Leidos.” The name was taken from the middle of “kaleidoscope,” and according to a press release it “reflects the company’s effort to unite solutions from different angles.” What those angles are is not exactly clear, however. Judging by his attire and location, Martinez presumably works for the company’s environmental engineering division, which has a contract with the U.S. Army Corps of Engineers, the agency that oversees the clean up of FUSRAP sites in St. Louis. Leidos is the federal government’s largest cyber-intelligence contractor, bigger than Booz Allen Hamilton, the spooky security firm that employed exiled whistleblower Edward Snowden. In short, the company spies on people for the U.S. government, including American citizens. Leidos was created in 2013 when Science Applications International Corp. spun off a large portion of its classified government work. Both SAIC and Leidos have received multi-million-dollar contracts to do clean up work for the U.S. Army Corps of Engineers Formerly Utilized Site Remediation Program (FUSRAP) in St. Louis, including the continuing cleanup of Coldwater Creek in North St. Louis County. Leidos’ St. Louis offices are located on South Grand Boulevard in a renovated automobile repair garage. The building’s newly installed mirrored windows reflect the secretive nature of its government business, which is estimated to be valued at $60 billion. The company employs 80 percent of the private-sector work force engaged in contract work for U.S. spy and surveillance agencies, including the Department of Defense, Homeland Security, CIA and NSA. Leidos also has a contract worth more than $300,000 with the Missouri Department of Natural Resources through its federal facilities management division. So the company is performing work for both the state and federal government with little or no public oversight. When the DNR declared an emergency at the smoldering Bridgeton Landfill in 2013, the state agency skirted its formal bidding process, an out-of-state firm scored a sweet deal and the public was left none the wiser. On March 18, 2013, environmental specialist Dan Norris and his boss Brenda Ardrey of the Missouri Department of Natural Resources quietly submitted a memorandum to Procurement of Services File RFP 3445-001. 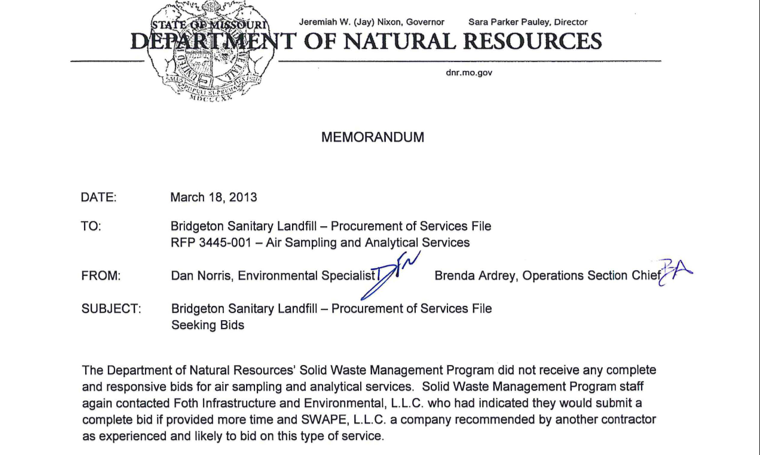 The memo shows that the department did not receive any bids that complied with the agency’s standards for air sampling services at the Bridgeton Landfill, where an underground fire has been burning near radioactive waste since 2010. Nevertheless, a six-figure contract was awarded to SWAPE, an environmental firm from Santa Monica, Calif. The acronym stands for Soil Water Air Protection Enterprise. SWAPE, acting as a middle man, then hired a St. Louis-based subcontractor. The paper trail indicates no complete bids were received even after the DNR extended the deadlines by more than two weeks. The DNR guidelines normally require a minimum of three competitive bids. Two companies ultimately proposed deficient offers. By its own admission, the DNR awarded the plum to one of those companies based on an incomplete proposal. The DNR was able to skirt its normal protocols by invoking an emergency clause in its procurement process. Finding an environmental company then willing to challenge the interests of waste industry behemoth Republic Services, the landfill owner, appears to have been a difficult task for the DNR, according to public records obtained by StLReporter. So the agency turned to a trusted consultant to act as its de facto headhunter. The consultant contacted industry sources and ultimately recommended SWAPE. After getting the nod, SWAPE quickly lined up a subcontractor in St. Louis to do part of the work. Nobody involved in the deal will talk about it openly, citing contractual obligations. Following an-age-old American custom, Norris has moved out West. He now lives in the Rocky Mountain Time Zone. He prefers not to divulge exactly where. Norris has exited Jeff City. But questions swirling around his leave-taking still plague his former agency like a bad case of the winter flu. Early last month, Norris wrote a broadside, condemning the agency for its cozy relationship with Republic Services, the company responsible for the site in North St. Louis County that is the location of a pair defunct landfills: one that’s smoldering and the other that contains radioactive waste dating back to the Manhattan Project. The two adjacent dumps are both part of a long-delayed Environmental Protection Agency Superfund clean-up site. In his parting shot, the former DNR staffer alleged that politics unduly influences regulatory decisions within the state agency, and that DNR employees are under the gun not to talk about it. The revelations have caused a stir inside and outside of the DNR. Activists and community members familiar with the situation tend to agree with the whistleblower’s assessment, seeing Republic–the second largest waste hauler in the United States — as their foe. They point to Bill Gates’ stake in the company as evidence of the power that it wields. They allude to the company’s checkered environmental record elsewhere, including another smoldering landfill fire in Ohio. They also agree with Norris’ contention that Republic’s generous campaign contributions have swayed state lawmakers. In that sense, it is not what Norris revealed that is relevant so much as the act itself. He broke the code of silence inside a department that in recent years has operated more like the CIA than a state environmental regulatory agency. Unfortunately, Norris’ criticisms of the DNR are vague, and his complaints raise more questions than answers. His account of agency wrongdoing is sketchy. He lays blame but buttons up when asked for details. Under prevailing rules, DNR has been assigned the responsibility of containing an underground fire and reducing the noxious odors at the Bridgeton Landfill. The state maintains that Republic is liable for the expense of the emergency air sampling costs, but it’s unclear whether the company has ponied up. Reached at his office in Washington, D.C., Republic spokesman Russ Knocke was unaware of the contract and said he would have to do some homework to determine whether the state has been reimbursed. The radioactively-contaminated West Lake Landfill next door is the bailiwick of the federal EPA. As the two bureaucracies advance their separate agendas at a glacial pace, the fire is heading in the direction of the nuclear materials. In Norris’ absence, the status of the clean up has become more uncertain than ever. The building of a state mandated barrier to stop the fire from advancing has been indefinitely delayed. In the interim, doubts mount, finger pointing increases, and nobody seems in control. Missouri Attorney General Chris Koster recently expedited the state’s case against Republic for violations filed two years ago, but there is no sign of a settlement. If anything, the company shows indications of being even more resistant to DNR’s appeals. Meanwhile, the activists are stepping up their calls for Gov. Jay Nixon to take action. From outside DNR’s closed doors, the scenario seems bleak. There would appear to be no winners. However, department documents and correspondence show how one group consistently benefits from the intractable predicament — outside contractors. Norris says he met DNR contractor Todd Thalhamer in 2008 at a training seminar. For the last several years, Thalhamer has given talks on landfill fires sponsored by Stark Consultants Inc., which is owned by Tim Stark, another DNR contractor. Thalhamer moonlights as a consultant, too, and owns Hammer Consulting Service in El Dorado, Calif. He works full-time as an environmental engineer for the state of California and is a firefighter in the El Dorado Volunteer Fire Department. Thalhamer received a bachelor’s degree in environmental resources engineering from Humboldt State University in Arcata, Calif. in 1992. His five-page resume indicates he worked on his first landfill fire in Sacramento County the same year he graduated from college. 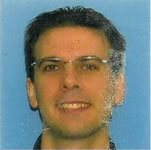 He has been under contract as a landfill fire expert for the DNR for the last four years. Then the odors at the landfill increased. “By 2012, I was making a push that we really needed to collect some air-monitoring data to get a better handle on what the potential risks were from the landfill smoldering event, as well as just what risk that might be as far as exposing the community,” Norris says. The increased odors coming off the Bridgeton Landfill in 2012 gave DNR cause for concern as public complaints mounted over the stench. This set the stage for the events that would lead to the emergency procurement contract in early 2013 in which Thalhamer would play a pivotal role. A few months earlier in December 2012, the DNR had held a one-day training session presented by Thalhamer at Republic Service’s headquarters on St. Charles Rock Road. Those in attendance included, DNR staffers, representatives of the Pattonville and Robertson Fire Protection Districts, and officials from the St. Louis County Health Department. Brenda Ardrey of the DNR arranged the meeting and Republic, picked up the lunch tab for the sandwiches from a nearby Jimmy John’s restaurant. Thalhamer charged $150 an hour for his services. Including various conferences calls, planning and travel expenses, the bill totaled $6,695.49. 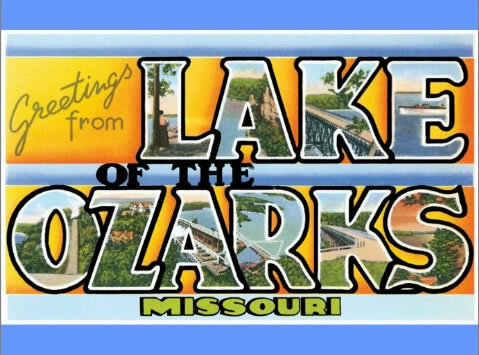 His performance impressed Ardrey so much that she arranged for Thalhamer to speak the next summer at the Missouri Waste Control Coalition’s annual conference at the posh Tan-Tar-A resort on the Lake of the Ozarks. The 400-member coalition is comprised of private waste companies, government regulators and consultants. The conference setting had the trappings of a country club, including a golf course, where the MWCC held its annual tournament over the same weekend. The clubby atmosphere between business and government regulators goes beyond the 18th hole, however. Ardrey’s boss Chris Nagel, director of DNR’s Solid Waste Management Program, sits on the advisory board of the waste coalition, and Larry Lehman, DNR’s chief enforcement officer, is on its board of directors. Besides Lehman, other board members include Randy Tourville of Republic Services and Lisa Messinger of EPA Region VII. After DNR decided to fund air sampling at Bridgeton Landfill in early 2013, Thalhamer put SWAPE on DNR’s radar. Thalhamer and one of the owners of SWAPE had both worked on a case related to another Republic landfill fire in Ohio years earlier. Within a week, SWAPE had secured the DNR’s air-sampling contract without going through the regular bidding process. That’s because a month earlier, DNR had quietly invoked an emergency clause in the state statutes and allocated more than a half a million dollars for the job. Internal DNR emails show officials carefully researched the matter to make sure the agency followed the letter of the law in declaring the emergency. Few outside the DNR knew about the emergency. No sirens went off. The governor didn’t issue an evacuation order. Residents were not kept fully in the loop. Instead, agency insiders kept the situation hushed. The only other company that expressed interest in the contract submitted a proposal that was less acceptable than SWAPE’s. Unlike others wary of consequences, SWAPE showed no fear of rousing the ire of Republic because it had already had a falling out with the waste giant in the past. On March 21, within 48 hours of receiving the contract, Paul Rosenfeld of SWAPE flew to St. Louis for a one-day meeting with DNR officials. A subcontractor identified in an invoice only as JB also attended the talks. John Blank is the the owner of American Environmental Laboratories, a St. Louis-based firm that SWAPE hired as a subcontractor. Blank says the terms of his company’s involvement remain confidential, but he does reveal that SWAPE issued the requirements for conducting the air sampling — “the what and the how” — and the St. Louis lab reported the results back to SWAPE and the DNR. The meeting between SWAPE and the DNR lasted 11 hours, according to public records. Rosenfeld charged $195 an hour. The subcontractor charged $120. SWAPE billed DNR a total of $5,821.86 for the day. The terms of the emergency air-monitoring contract approved by DNR on Feb. 15, 2013 stipulated a 60-to-90 day deal valued at $600,000. SWAPE’s incomplete proposal submitted on March 29 totaled $594,060. After the contract was signed, invoices and purchase orders were issued in quick succession. On March 29, 2013, SWAPE submitted an itemized invoice of $15,198.32 for services rendered. On April 2, 2013 the state paid the company another $6,000 for expert testimony. A state purchase order for SWAPE’s products and services dated April 3, 2013, shows a bottom of line of $349,000. Whereas, SWAPE submitted detailed, line-item accounting of services rendered, the state purchase order only lists itemized expenses as “environmental, ecological and agricultural services: miscel [miscellaneous].” SWAPE continued its emergency air sampling under the initial arrangement through August 2013. Less enigmatically, Norris concedes that there may be an appearance of something amiss in the state’s handling of the emergency air-monitoring contract, but he has no doubt that the public’s interest was best served by the decision. “SWAPE had the expertise, the history of sampling around landfill fires elsewhere” says Norris. “I think that they were probably in the best position at that point and time to do the air sampling whether it was done by them or a subcontractor that was progressing in a fashion that was protective of public health,” Norris says. Air sampling at the site measured dioxins, furans, benzene, aldehydes, reduced sulfur compounds and volatile organic compounds, all of which can cause serious health effects through long-term exposure. But test results at the Bridgeton Landfill analyzed by the Missouri Department of Health and Senior Services found chemicals of concern to be below the threshold of concern for human health over the time frame of the emergency air sampling contract. Norris doesn’t argue with those findings, but he does assert that politics is influencing science. “Politics seems to be invading the technical work to a greater extent than when I first started that’s for sure, [but] we were able to accomplish quite a bit even within the political confines during this event, especially in 2013,” he says. Norris makes clear that his resignation and subsequent letter are unrelated to the SWAPE memo or the hiring of outside contractors in general. “It was really kind of broader issues at the department,” he says. He mentions bureaucratic inefficiencies, the role of politics and lax enforcement as reasons for his discontent and departure, but stops short of placing the onus on anything specific, leaving the listener to turn Rubik’s Cube for himself. The EPA fudged its 2014 test results of the Bridgeton Athletic Complex, assuring the public that the ballfields were safe, while withholding data that warranted further investigation. Internal EPA emails show the agency was aware that radiation levels at the Bridgeton Athletic Complex were above background levels, but failed to clearly alert the public of its findings in a timely manner. The series of internal agency emails obtained by The First Secret City reveal that the EPA knew that multiple radio-isotopes found within inches of the surface at BMAC exceeded 5 pico curies per gram, one of the varying benchmarks set by government regulators to determine so-called permissible levels of exposure. In an email dated June 23, 2014, Cecilia Tapia, director of Environmental Sciences and Technology for EPA Region 7, cited differing action levels for radioactive isotopes and advised her colleagues that they should consider swapping one standard over another. Using one set of numbers instead of the other could have effected the EPA’s decision on BMAC. SLAPS is the acronym for the 21.7 acre St. Louis Airport Site, a radioactively-contaminated property originally under the control of the U.S. Department of Energy. In 1997, that clean up was handed over to the U.S. Army Corps of Engineers, which has authority over it and other sites in the St. Louis area through the DOE’s Formerly Utilized Site Remediation Program (FUSRAP). DOE’s permissible levels are generally stricter than the EPA’s corresponding standards. The EPA official’s comment is subject to interpretation, but any way it’s sliced the numbers cited in the related email chain among EPA contractors and agency officials show one undeniable fact: The EPA had verified through its own testing that there were radiation levels of concern at BMAC, but then acted to downplay the significance of its own findings. Three days after Tapia suggested revising the applicable standards, then-EPA Regional Administrator Karl Brooks assured the public there was no cause for concern. In its June 26 press release, the EPA announced without equivocation that it was safe to play ball at BMAC. Brooks assurances came despite knowledge that levels of Lead 210, Potassium 40, Thorium 234 and Uranium 238 detected at BMAC exceeded naturally occurring background levels of those isotopes in the environment. The administrator’s questionable assurances were based on an arcane agency formula that mandates remedial action only when radioactive contamination is found to be twice the normally occurring background levels. Moreover, EPA remediation standards are not as strict for recreational areas. In this case, the EPA gave its stamp of approval to allow children to play baseball in an area that was determined by its own testing to be radioactively contaminated. Department of Energy guidelines for thorium and radium concentrations mandate they not exceed 5 picocuries per gram averaged over the first 15 centimeters of soil and 15 picocuries per gram in subsequent soil layers of the same thickness. The EPA testing at BMAC found Thorium 234 levels of 5.14 pico curies per gram. But EPA standards aren’t as stringent as DOE’s. The EPA’s action level for Thorium is 7.9 pico curies per gram. Before the EPA began any testing at BMAC, Brooks held a press conference at the Bridgeton City Hall on May 9, 2014 to announce that the ballfields were safe and dismiss the independent test results carried out by Just Moms STL, a community organization. Dawn Chapman of Just Moms STL believes that the EPA deceived the public concerning the levels of radiation at BMAC. The organization she founded has been fighting for years to remove the radioactive waste from the nearby West Lake Superfund Site in Bridgeton. Chapman questions why the agency didn’t dig deeper after finding radioactive contamination near the surface at BMAC. We are pleased to announce that The First Secret City will be broadcast in June each Tuesday evening at 8 p.m. on the Higher Education Channel (HEC) in St. Louis. Our film is being aired on Frames, a program dedicated to offering films by St. Louis filmmakers. HEC is available on cable channels 108.26 or 118.26 through Charter TV in the city of St. Louis and St. Louis County. For those with AT&T U-Verse please tune in channel 99. If you use a converter box please tune in to channel 989. We thank HEC and Frames host Jim Althoff for providing this opportunity to share our film on the radioactive waste issue with a wider audience. Before the creation of the secret cities of Los Alamos, Oak Ridge and Hanford, the Manhattan Project hired the Mallinckrodt Chemical Works of St. Louis to refine the first uranium used in the atomic bomb dropped on Hiroshima. For the next two decades, Mallinckrodt continued its classified work for the Atomic Energy Commission during the Cold War. The resulting radioactive waste contaminated numerous locations in the St. Louis area some of which have not been cleaned up 70 years after the end of World War II. Told through the eyes of an overexposed worker, the story expands through a series of interviews that careen down a toxic pathway leading to a fiery terminus at a smoldering, radioactively-contaminated landfill. The First Secret City is a feature-length documentary that reveals a forgotten history and its continuing impact on the community in the 21st Century, uncovering past wrongdoing and documenting the renewed struggles to confront the issue.